3rd match of Carlton Mid Tri-Series has been played between India and England at Brisbane Cricket Ground, Woolloongabba, Brisbane today. England won the match by huge margins of 9 wickets with bonus points. India totally flop show in all department. Batsmen knees down against England pacers and Bowlers failed to bowl well. Earlier, India won the toss and decided to bat first. India could not made batter start and lost S Dhawan for 1 run. AM Rahane and Rayudu played good cricket initially but, India lost sudden 4 wickets in 10 runs interwals. Skipper Dhoni and STR Binny tried their best but, India all out scoring just 153 runs in 39.3 overs. Following small target of 154 runs, England lost Moin Ali early scoring just 8 runs. IR Bell 88* and JWA Taylor 56* chased India's small total in 27.3 overs and won the match by huge margins of 9 wickets with bonus points. 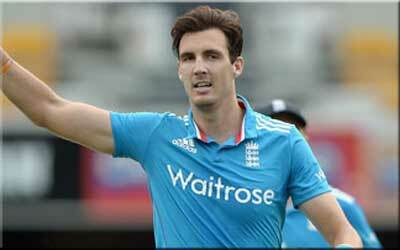 Player of the match - Steven Finn (England) - 5 wickets of 33 runs in 8 overs.